A big 5-peak day including the high point of Death Valley National Park. Telescope Peak is the tallest peak in Death Valley National Park, the highpoint of the Panamint Range. The mountain was given its name because of the great distances you can see from the summit on a clear day, over one hundred miles in several directions. The normal route follows a trail from Mahogany Flats, covering 14 miles round trip. I made the drive from Boise the previous day and camped at Wildrose Campground. The next morning, I drove to Charcoal Kilns, although in hindsight the road to Mahogany Flats had been recently graded, so I probably could have made it up, even with a low clearance vehicle. It was a chilly morning, and it started snowing not long after I started hiking. So much for heading south to find warm weather! 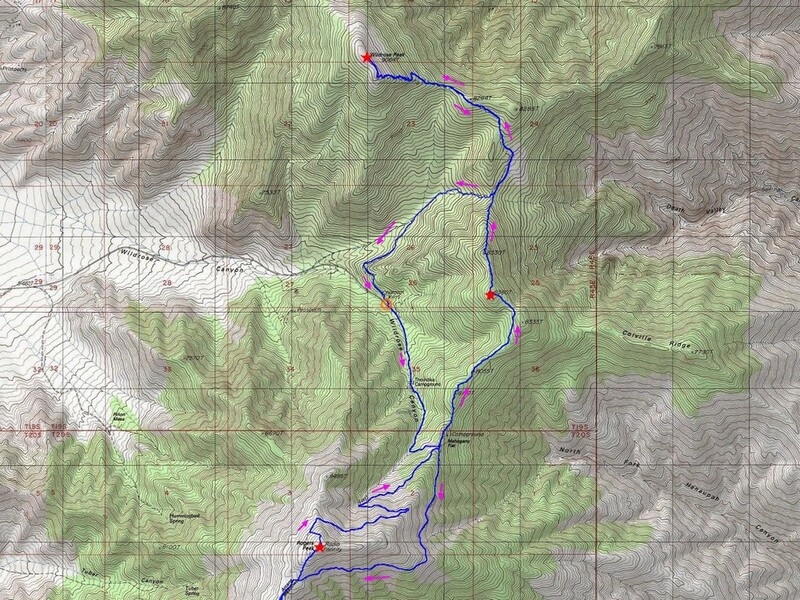 I hiked quickly up the road to the main trailhead, and then hit the trail leading to Telescope Peak. Unfortunately, cloud cover and blowing snow made for limited visibility. As I reached Arcane Meadows and rounded the west side of Bennet Peak, the wind and snow both increased, making for some harsh conditions. Fortunately the snow wasn’t accumulating much, so I could easily make out the trail for the most part. With little in the way of views to slow me down, I set a fast pace until the trail got steeper and snowier for the last mile to the summit. This last section took a little route finding through a few lingering snow fields, but I made it to the top without incident. The summit was all fogged in, which was anticlimactic, so it wasn’t long before I headed back down. Eventually the clouds lifted a bit as I neared Bennett Peak. Bennett makes for a short side trip away from the main trail, and I stopped for a PB&J on the summit. Soon enough the wind was making me cold, so I continued on to the north, taking another side trip to the top of Rogers Peak, adorned with a bunch of communication equipment and buildings. The section from Mahogany Flat to Pinjuni Peak was very enjoyable, as I wound through rock formations, cactus, and others light vegetation on the way to the summit. The highpoint had a red register can with a few signatures, but the area doesn’t see much traffic. From here, I continued north to the saddle where the Wildrose Peak trail reaches the ridge. Once at the saddle, I had another decision to make. Head down to Charcoal Kilns, or continue to Wildrose Peak? I’d already hiked 17 miles, but was still feeling strong. Lured by the chance for another summit, and better views, I decided to continue. It was 2 more miles of trail hiking before I reached the summit, and the views made it worth the extra effort. It was breezy on the summit of Wildrose Peak, so I bundled up while snacking on granola bars and enjoying the expansive views. But it was starting to get a little late, and I still had several miles to cover, so it was time to hit the trail. I was glad it was all downhill from there, and set a brisk pace back to the car. It had been a fantastic 5-peak day in the mountains. 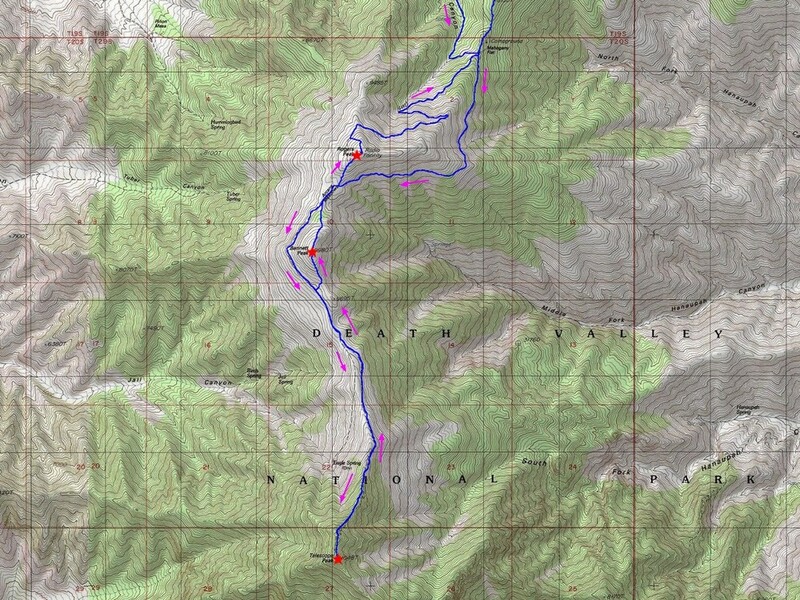 Round trip was a whopping 24 miles and 8000’ elevation gain in 11 hours of hiking. I think I made the most of the day! Map of the northern part of the route. Map of the southern part of the route. Charcoal Kilns in the morning. Snowing on the road hike to Mahogany Flat. Telescope Peak trailhead at Mahogany Flat. Lingering April snowfields on the north slopes of Telescope Peak. Foggy on the summit of Telescope Peak, high point of DVNP. Finally a break in the weather while hiking down Telescope Peak. Bennett Peak from the south. Rogers Peak from the south. Telescope and Bennett from Rogers. Back to Mahogany Flat and ready for more. Cross country hiking on the way to Pinjuni Peak. Me on the summit of Wildrose Peak, great views. Rogers Peak from Wildrose Peak. Almost back to the Charcoal Kilns trailhead. Map of the northern part of the route.Map of the southern part of the route.Charcoal Kilns in the morning.Snowing on the road hike to Mahogany Flat.Telescope Peak trailhead at Mahogany Flat.Snowy cactus!Lingering April snowfields on the north slopes of Telescope Peak.Foggy on the summit of Telescope Peak, high point of DVNP.Finally a break in the weather while hiking down Telescope Peak.Bennett Peak from the south.Rogers Peak from the south.Telescope and Bennett from Rogers.Back to Mahogany Flat and ready for more.Cross country hiking on the way to Pinjuni Peak.Pinjuni Peak summit register.Wildrose Peak trail.Summit of Wildrose Peak.Me on the summit of Wildrose Peak, great views.Rogers Peak from Wildrose Peak.Almost back to the Charcoal Kilns trailhead.